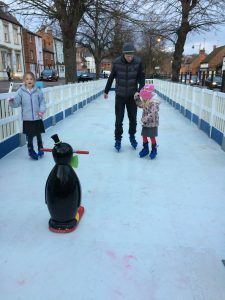 Over 1,100 people used the Buckingham Town pop-up synthetic skating rink which was operating in the town centre for nine days ending on Sunday. All money from ticket sales and sponsorship helped to fund the event, meaning the final cost to the Town Council was £676. 1,153 tickets were sold, with skaters using the rink between 3pm and 9pm. The event team running the rink commented that Buckingham is the most friendly place they have worked in. MK Lightning Ice Hockey Team supported the rink by sending Pucky the Polar Bear along with players to encourage skaters. This entry was posted in Events and tagged buckingham events, ice rink by Louise. Bookmark the permalink.